Mangaluru, Mar 22, 2017: Reports confirm that the Academic Council of MU, Mangalore University in its meeting on March 21, Tuesday approved the university’s affiliation to 11 new degree colleges. With this, the university will have 226 colleges under its jurisdiction spread over Dakshina Kannada, Udupi, and Kodagu districts. The colleges approved included an evening college, two women’s college, and two colleges offering diploma. The new colleges are: Dr B R Hegde First Grade Evening College, Kundapura (BA/BCom); Pana Institute of Under Graduate Studies, Kolambe, Bajpe (BCom/BCA/BA); Al Ishsan Women’s First Grade College, Muloor, Udupi (BCom); Samvit Education Institute Mangaluru (diploma in fire and safety); Samvedana Science and Commerce First Grade College, Khambadakone, Kundapur (BSc); Anugraha Women’s First Grade College, Kushalnagar (BA/BCom); A J Institute of Speech and Hearing, Kuntikana (BASLP); Medha College, Puttur (BSc Interior Design and Decoration); S S Degree College, Kushalnagar (BCom); Harward Institute of Fire and Safety (diploma in fire and safety) and Coorg Institute of Hospitality Sciences, Madikeri (BSc hospitality sciences). Affiliation : The meeting was chaired by vice chancellor Prof K Byrappa. A total of 121 private colleges and 36 government colleges had applied for renewal of affiliation, while three colleges had applied for permanent affiliation. The Local Inquiry Committee (LIC) of the university did not recommend for the starting of new PG courses (MA economics and MSW) to Government First Grade College, Vamadapadavu, for the year 2017-18, for want of qualified teachers. The affiliation committee of the university has not recommended starting BHM course at Government First Grade College, Kushalnagar, as the college has not shown interest in starting the course. The college has not even applied to AICTE for permission. The committee has not recommended permanent affiliation to Dr G Shankar Government Women’s First Grade College and PG Study Centre at Ajjarakadu in Udupi due to lack of fulfilment of the conditions laid down by the university. The council approved permanent affiliation to Alva’s College, Moodbidri. In this regard a number of colleges coming under the university, Kishori Nayak, a professor of the university, who headed a local inquiry committee visiting colleges on in inspection before renewal of affiliation, pointed out at the meeting that many private colleges in Ullal area were facing dearth of students. It was the case in at least eight colleges in the area, she said. Without mentioning the amount, a member of another committee, pointed out that a private college in Sullia was paying low salary to management paid teachers. Speaking to media on the sidelines of the meeting, K. Byrappa, Vice-Chancellor of the university, said that the university would introduce bio-metric attendance system to its postgraduate students at the Mangalagangotri campus and at its constituent colleges and postgraduation centres from the academic year 2017-18. 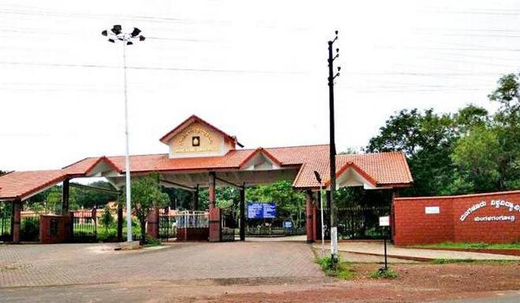 Biometric attendance : The vice chancellor said that biometric attendance for students and teaching faculty will be introduced at the Mangalore University campus and its constituent colleges from 2017-18. The biometric materials have arrived and will be installed by April 28 at all the department of Mangalore University in Mangalagangothri.